Massachusetts Oyster Project: The Po Boy Sandwich Rocks! The Po Boy Sandwich Rocks! At our household we buy our oysters by the 100, ordering them by mail from our friends at Island Creek or Cedar Point in Connecticut. Both are linked on this page. But sometimes if you have only 5-6 people, 100 can be too many oysters on the half shell. And while oysters will keep in the styrofoam shipping container for several days if you recycle the ice packs, I often found myself seeking a different way to enjoy those last 20 oysters. 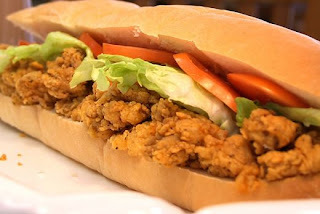 On Christmas Day, I rediscovered the New Orleans classic 'Po Boy Sandwich' and it rocked! The Po Boy is easy to make. just shuck a half dozen oysters, dip them in egg, then breadcrumbs then fry. Place about 6-8 fried oysters with chopped iceberg lettuce and sliced beefsteak tomato in a soft sub roll. It melted in my mouth with wonderful mouth feel mixing the warm oysters with the cool lettuce and tomatoes. Here is a link to an on-line recipe that uses fancier ingredients, but the sandwich still works amazingly well even if you stick to the basics. I may even get out and buy a tabletop fryolater to make the frying process simple.